The Ga believe in Reincarnation. Before being reincarnated some people will spend some time in Gbohiadzen (world of the dead). In order to reach this place the person has to cross a river with the aid of a certain spirit. This Spirit requires that the funeral rites have been performed and payments made before he will assist the newly departed across this river. As a result the Ga funeral is important. The Ga funeral rites ensure the separation of the newly departed soul from the physical world and their entrance into the ancestral world. Once its be found that a person has died, a group of family elders will meet to plan and set a date for the funeral. Their purpose is to also ensure that the rites are followed. People will be assigned roles and asked to purchase certain things such as the Kotsa for bathing, lemon, towels etc. This is where the family come together with the items needed to perform the rites such as the bathing. At the Kotsagbamo they ensure everything has been brought and it is organised in preparation for the rights. Libation is first prepared to appease the Divinities, gods and to placate the spirit of the deceased. The body is then prepared to be bathed. The bathing is done by a select group of people called ‘Gbonyohedzuloi’ which translates as ‘people who bath the dead’ and they are usually old widows. The bathing will be done with a new sponge and towel, both of which will be buried with the dead person. The bathing used to be done in the family home and in some cases if it is a married man who died, his wife would hold the feet of the man whilst he is being bathed. After the body has been bathed the body will then be embalmed by the same group of women who would usually bath the body and eventually dress them. The embalming process would usually preserve the body for a few more days to allow relatives especially the eldest sons and daughters to travel back and see the face of atta (father) or awo (mother) – this in Ga custom is very important. 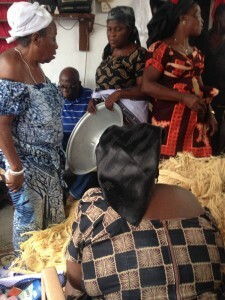 The ingredients used for balming were local ingredients and spices such as Ohe and Krobo. The body is then dressed in their best attire and laid to state. Every Ga person belongs to a family house which will have a special room where a family member will be bathed and laid to state. Once the dead person has been laid to state libation would be poured by the family elders. This libation is to again recognise the already departed spirits who would be welcoming this new spirit to the ‘otherside’. Once this has been done a number of professional mourners called Yaratsemei would come, wail and cry for the dead body – This custom is called Yarawo. When a person dies the person is usually presented with gifts – usually money or cloth – by the family members. This practice is also a reflection of the Gas belief in life after death. The gifts presented in this life are things he/she can enjoy and will need in the next life. It should be noted here that its not the physical gifts that would be taken into the next world, but the spirit behind them. Gas have always buried their dead. After the wake-keeping the person is buried with their sponge, towel, any remaining spices (which were used in their embalming and bathing) and all the gifts given to them. In the olden days the body would have been buried at home or in family burial site and would not be buried in a coffin but wrapped in a special material made of palm leaf- now its common to go to the public cemetery and be buried in a coffin. Both the widow and the widower will be required to carry out some ritual after the burial of the spouse – The widowhood rites are explained further on the widowhood page. In the olden days members of the family would also have shave their heads, not wear shoes or cook in their houses (usually where the dead person lived) for a period of time. The day after the burial it is said that a number of old men and women from the immediate family go and visit the grave of the dead (they will ask permission from the dead before entering the place of final rest). The purpose of the visit is to see how the person is faring in the land of the spirits – and ensure that no one has gone to the grave to take the treasures buried with the dead body. Once libation is poured and the conversation had, the party will then make their way home. The youngest will lead and the oldest last. On this journey home you cannot look backwards or engage in any conversation. They will then go back to the family house and report back on their findings. In some Ga communities there would be a rememberance service for the departed person. The day begins early with the elders of the clan and immediate family members meeting and pouring libation to placate the spirits of family members who have passed, family deities etc. The community – who would have all been made aware of the date and time of the celebration – meet to celebrate. Funeral games would be held, dances of various kinds danced, the Obonu drum will be beaten and there will be a feast.